Make cake batter as directed on box. Divide batter evenly among muffin cups, about two-thirds full. Bake about 20 minutes or until cupcakes spring back when touched in center. Cool in pans 10 minutes. Transfer to cooling rack to cool completely, about 30 minutes. Using serrated knife, cut a divot out of center of each cupcake, about 1 inch deep; reserve cutout cake pieces. 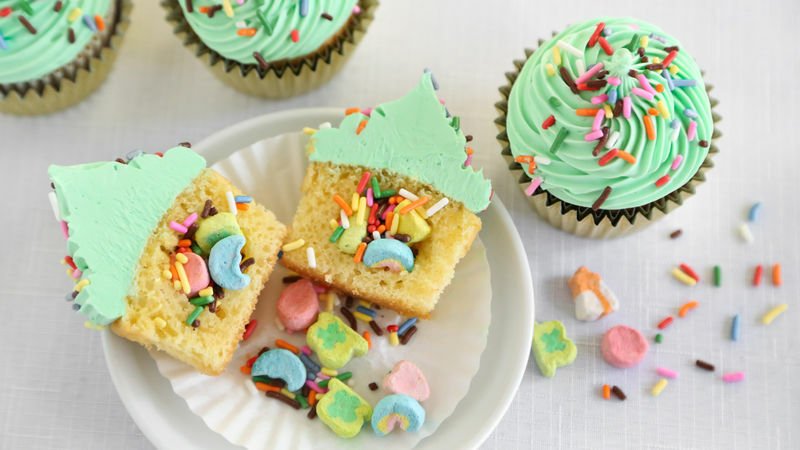 Fill each cupcake with 1 tablespoon Lucky Charms™ marshmallows (about 10 pieces). Sprinkle in a few rainbow jimmies. Trim reserved cake pieces flat, and cover holes in filled cupcakes. Spoon frosting into medium bowl; stir in enough food color for desired green color. Transfer frosting to decorating bag fitted with large star tip, and pipe on tops of cupcakes. Or, frost cupcakes with an offset spatula. Garnish with rainbow jimmies. Store cupcakes at room temperature loosely covered with plastic wrap. Fill and frost cupcakes just before serving if you want a crunchy marshmallow surprise. Or, fill them at least 2 hours ahead of time for a soft marshmallow center. Gold foil or rainbow cupcake liners make festive St. Patrick's Day cupcakes.